A 67 year old man tripped down some steps at a pub and hit his head. He is brought to the ED by ambulance. He is GCS 10 (E2V3M5), with PERL and no focal neurological deficits. He has a haematoma on his right temporal region. Q1. Which patients are at highest risk of morbidity and mortality from traumatic brain injury? Q2. How is the severity of traumatic brain injury classified on initial assessment? 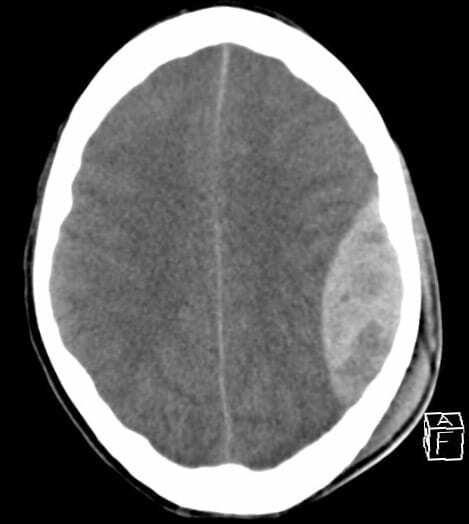 Based on GCS, this patient has a moderate severity TBI. Q3. What is the difference between primary and secondary brain injury? Primary injury occurs at the time of the initial traumatic event, and may be focal or diffuse. Focal injuries include hematomas, contusions and lacerations resulting from blunt or penetrating trauma. Diffuse injuries typically result from acceleration-deceleration forces and affect the whole brain resulting in axonal shearing or concussion. Secondary injury is potentially preventable and reversible, and occurs after the time injury. Mechanisms of injury include oedema, hypoxia, hypotension, and metabolic disturbance.Once the primary brain injury has been recognized, the main objective of the management of acute traumatic brain injury is the prevention of secondary brain injury. Q4. 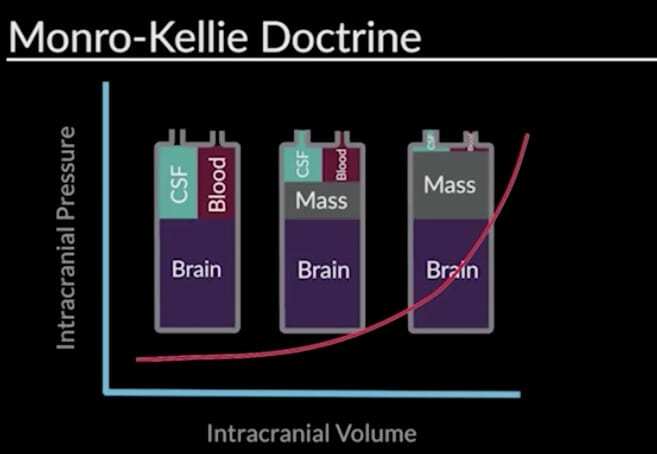 What is the Monro-Kellie doctrine and what are the implications for the management of traumatic brain injury? The Monro-Kellie doctrine holds that the brain lies within a rigid box (the cranium). In addition to brain, within the rigid box there is blood and cerebrospinal fluid (CSF). As a result, expansion of the volume of any of the components must be offset by an equal decrease in volume of the others or intracranial pressure will increase. The compensatory capacity within the non-compliant cranium is limited. The capacity for CSF to displace into the spinal theca and into the venous system via arachnoid granules, and intracranial blood to redistribute peripherally is easily overcome. 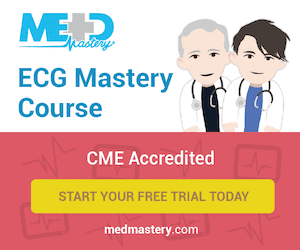 This usually occurs with mass lesions of about 100 to 120 mls, and when it does intracranial pressure increases linearly. 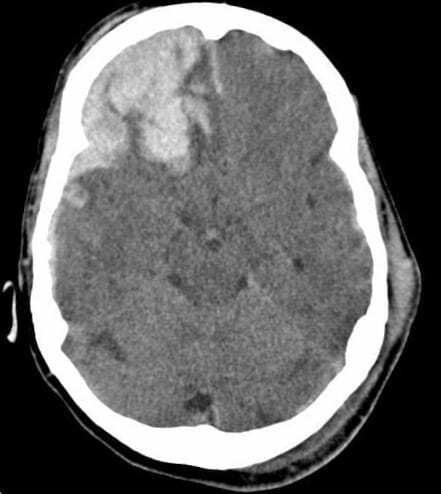 The implication for management of traumatic brain injury is that space is at a premium, and aggressive treatment to control the volume of intracranial contents is essential to prevent raised intracranial pressure which can lead to compression of vital brain structures, impaired blood flow to the brain and ultimately death. Q5. What is cerebral perfusion pressure and how does raised intracranial pressure impair blood flow to the brain? Blood, like any other fluid, tends to flow from high to low pressure. Hence raised intracranial pressure decreases the pressure gradient favouring blood flow to the brain. Hence, CPP is used as a surrogate marker of cerebral blood flow. It also follows that to maintain blood flow to the brain in the presence of raised intracranial pressure, and increased driving pressure (i.e. mean arterial pressure) is required. Q6. How is the concept of cerebral autoregulation relevant to traumatic brain injury? 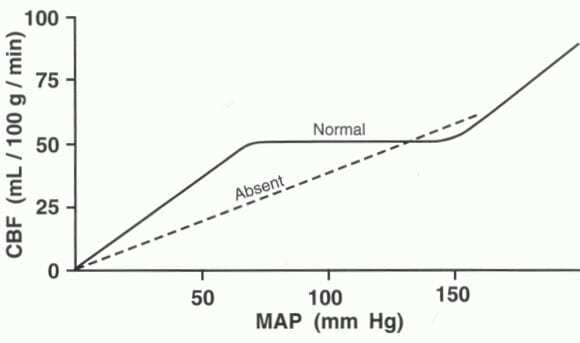 CBF will fall when the MAP is below the range of autoregulation, and rise when the MAP is above the range of autoregulation. The injured brain is unable to perform cerebral autoregulation. As a result CBF is directly dependent on MAP, resulting in the dashed linear curve shown above. Thus optimize of MAP is critically important in the management of severe traumatic brain injury.Hypotension (SBP <90 mmHg) doubles mortality in patients with severe TBI. Q7. 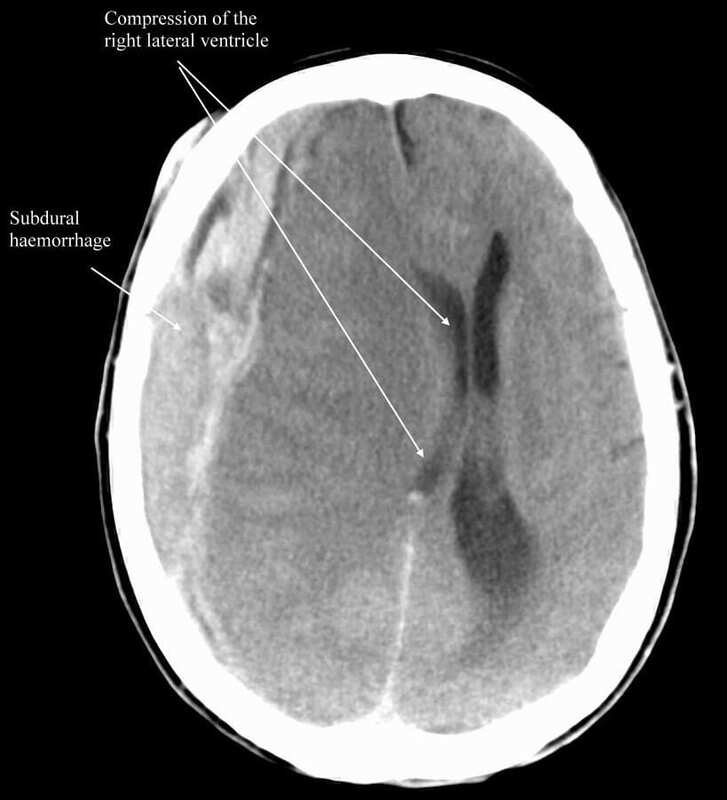 What are the common indications for a head CT in traumatic brain injury? In practice, I use the Canadian CT Head Rules (available here at MDCalc) in combination with clinical judgment and considerations such as coagulopathy, GCS <13 and focal neurology as listed above. Of note, the Canadian CT Head Rules were designed to be used in GCS 13-15 patients with witnessed loss of consciousness, amnesia to the head injury event, or confusion. Q8. Describe what is shown? On returning to the trauma bay from the CT room he is now GCS7 (E1V2M4). Q9. Describe your overall approach to the management of a patient with severe traumatic brain injury. Activate the trauma team and use a coordinated team-based approach in a dedicated trauma bay appropriately staffed and equipped for resuscitation. — suspect critically raised intracranial pressure if: Cushing’s response (bradycardia, hypertension, apneas), fixed and dilated pupil(s), hemiparesis. — treat suspect critically raised intracranial pressure: head up 30 degrees, remove neck constrictions, administer mannitol 0.25 to 1 g IV bolus or 3% hypertonic saline according to local guidelines, urgently liaise with neurosurgery and consider burrholes if transfer to neurosurgeon likely to take >2 hours. — treat seizures and consider prophylactic anticonvulsants according to local guidelines. — Remember FASTHUGS IN BED Please! Q10. Anatomically, what are the different types of traumatic brain injury? — Classically (i.e. <50%) have lucid period after injury before subsequently deteriorating (aka “talk and die”). — Due to tearing of veins draining cerebral cortex. — Ranging from contusions to haematoma. — Can evolve over time. — Some advocate observation and / or repeat scanning in 24-48 hours. All of these lesions may occur in isolation or in combination, and may present with altered mental state for focal neurological deficits. Neurosurgical consultation is required and operative intervention may be necessary. Intracranial lesions are more likely in the presence of skull fractures. Resus.ME — Burr holes by emergency physicians. Teasdale G, Jennett B. Assessment of coma and impaired consciousness. A practical scale. Lancet. 1974 Jul 13;2(7872):81-4. PubMed PMID: 4136544.